The second half felt nervy at times, Liverpool fans won’t want to see too many games where they’re playing as deep on their own turf as many visitors to Anfield have in recent seasons. But after the start to the season Liverpool have had it’s understandable that the manager felt it was best to hold onto what they’d managed to achieve in the first half. Had Torres not got that second just a minute before the break those kind of second half tactics would have been far more nailbiting for fans to watch. This wasn’t the side Hodgson had planned to use for the game, a late injury to Glen Johnson and a bout of tonsillitis for Soto Kyrgiakos meaning he had to change the line-up on the day of the game itself. It’s unlikely that all eleven starters will be there at the outset for the trip to the DW Stadium on Wednesday; this was a tiring encounter for a side who worked their backsides off for the full 90 minutes. But none of these players should be absent based on their performances today. It was also interesting to note that there was no place in the starting line-up for Christian Poulsen, arguably the worst buy of the few Roy made this summer. Even more interesting was the decision to leave Poulsen on the bench when the manager made his three late substitutions. Liverpool’s new owners were at today’s game to show their support but where their support has really had an impact is away from the crowds and the cameras, in private meetings with players like Fernando Torres. From looking like a player disillusioned with the club’s future direction the Spanish striker looked today like someone who’d finally been given some promises he felt would be kept. 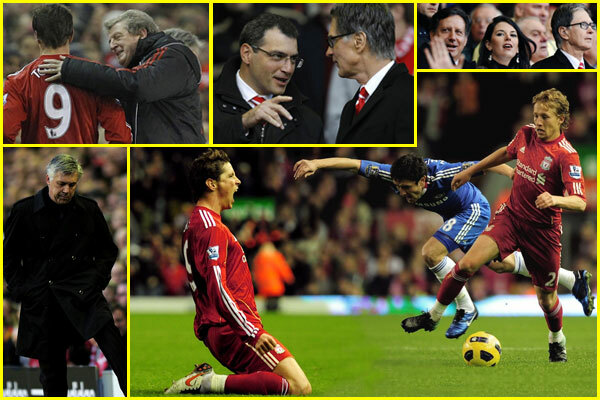 The appointment of Damien Comolli perhaps worked as the biggest sign yet that things were going to change at Anfield. After the game Torres was happy with the win but emphasised to Sky Sports how important it was to show the same kind of spirit and perform at the same kind of level in all Liverpool matches, regardless of the opposition. “We knew our start to the season was not good enough,” said Nando. “Liverpool have never been in the relegation [places] after nine games. “We are now going forward in the table, playing better every day. We thought from the beginning we needed time to work with a new manager and with new players. “We have to show now with the teams in the middle of the table, with the teams not as good as Chelsea, that we can play in this way; we can play with the same intensity, with the same quality and we will be fighting for bigger things. But now is our opportunity to show next week against Wigan and against Stoke that we can keep winning games. “At the end of the day it’s three more points but everyone knows it’s a different game it’s a top game, it gives you not only the three points but it gives you more confidence especially with it being a tough week. “We’ve won three games in seven days but we have to forget this game now and start thinking Wigan on Wednesday night. And we have to keep getting points because we lost a lot of points at the beginning and we have to win every game now. “It’s been difficult. It was a tough end of the season for me, difficult moments in the World Cup, a lot of injuries, difficult training every day but every day I am feeling better and improving every day. Asked about the criticism he’s had in some quarters for his performances he said he’d taken it on the chin: “It’s part of the life of a footballer, being criticised, but football is like this. Even if you’re playing for a team like Liverpool everyone is watching every game, everything you do is around the world in the next minute. Wigan and Stoke should be easier opponents than Chelsea, but Liverpool have a habit of making life difficult for themselves and defeats against Blackpool and Everton show exactly how they’ve done that this season. But there’s a sense that the cloud has been lifted at Anfield, that NESV have had words that have lifted morale, that Liverpool can get back on track. Roy Hodgson was seen by many as little more than a stop-gap appointment until the club’s financial position had been resolved. The man who hired him has gone and the day that happened he must have known his only hope of hanging on to his job was to start bringing the results in. And, for three league games in a row now, he’s done that. Liverpool: 25 Reina, 34 Kelly, 23 Carragher, 37 Skrtel, 3 Konchesky, 4 Meireles (26 Spearing), 21 Lucas, 8 Gerrard, 17 Maxi, 18 Kuyt (33 Shelvey), 9 Torres (24 Ngog). Unused subs: 41 Hansen, 22 Wilson, 28 C Poulsen, 14 Jovanovic. Chelsea: 1 Cech, 2 Ivanovic (17 Bosingwa), 3 A Cole, 26 Terry, 33 Alex, 7 Ramires, 12 Mikel, 15 Malouda, 18 Zhirkov (23 Sturridge 76), 21 Kalou (11 Drogba 46), 39 Anelka. Unused subs: 22 Turnbull, 19 Ferreira, 46 McEachran, 44 Kakuta. Jim, surely that possession stat’s not right? There’s no way we had more of the ball than them! I’d consider myself a Roy detractor and have felt for some time hes not up to being manager of LFC. Tonight though its only fair to give him credit where credit is due. Skys got it at 34.7 % possession to Liverpool and 65.3% to Chelsea, sounds a bit more accurate. Good performance, Feels great cause it was an unexpected result and good team effort. Lucas and Meireles are the best dou for central midfield now. And that has to be preserved. I hope Hog relegates Poulsen to FA Cup and reserve games for good and put Spearing and Jonjo in there instead. We need speed and youth to have any chance of winning consecutive games. Lucas has been our most improved and committed players since January this year. I always said (not on here but in real-life) that he is like Falcao (former Roma and Brazil player of the 80s). Falcao was a later bloomer, He only started to bloom best when reached 25 and beyond, Unlike Socrates who was brilliant straight off. While Falcao was a box to box player who can play different roles in midfield when needed to and with a mean shot. Now if Roy can prove to me that he can win 7 BPL (3 now, 4 more to go) games in a row I will take back what I said about the fact that he should go now. Looks like John W. Henry is planning to keep Roy for the this atleast. Which if we can finish in the top 8 or top 6 I would not mind personally. And than in the summer restructure the entire coaching and managment structure. Just updated it to show figures from the BBC, the Guardian and Sky. The BBC’s figure for possession is the same as quoted elsewhere, but it’s massively different to that from Sky, which is also quoted elsewhere. The agree on the number of corners, which would no doubt please Gerard Houllier! Massive difference in the possession stats though. Speaking shortly after a Torres double rescued him from further Anfield humiliation against Chelsea, Roy Hodgson claimed that former manager Rafa Benitez – and not he – should accept full responsibility for the recent appalling improvement in results. “The squad I inherited is not as full of flip flops as I made out,” said the Englishman. “But I still have a massive rebuilding job if we are once again to rub shoulders with the likes of Wigan, Bolton and Fulham. Bizarre that they can be so different. This may be a rare occasion im agreeing with Sky over BBC! Little differences are no surprise, but I’ve not seen this happen to this extent before.